Milwaukee co-founder Laurent Solomon Juneau was born on August 9, 1793 at Repentigny, a small farming village near Montreal. Juneau entered the fur trade as a teenager, working (perhaps) for the Hudson’s Bay Company before becoming an independent agent based in Prairie du Chien. In 1818 the young voyageur met Jacques Vieau, a well-established trader who employed Juneau, possibly as a clerk. One year later Vieau gave Juneau control of his Milwaukee-area trading agency. Juneau married Vieau’s métis daughter Josette in 1820, and the couple took up residence at what is now the corner of North Water Street and East Wisconsin Avenue. Tall and well-built, “Solomo” (as he was known to his native partners), developed good relationships with the local Potawatomi and Menominee tribes and built a thriving business on the east side of the Milwaukee River. By the mid-1830s, “Juneautown” had transitioned from a secondary outpost to a trading center, poised to eclipse Green Bay as the base for the region’s fur market. Juneau was a savvy merchant and businessman who entered into townsite development and real estate speculation enthusiastically. In 1831 he began learning English and became an American citizen. Then in 1833 Juneau met Morgan L. Martin, a Green Bay lawyer with whom he would maintain a lifelong professional and personal relationship. Combining Martin’s legal and real estate experience with Juneau’s pre-emption claim to valuable lands, the two set out to turn the trading post into a city. Sales from the Juneau-Martin land holdings made fortunes for both men and launched Juneau into political prominence. He sold supplies to the booming construction industry, oversaw real estate sales, and hired contractors to grade streets. In 1835 Juneau became the first postmaster of Milwaukee. He and Martin donated land for a county courthouse at present-day Cathedral Square and in 1836 built a well-respected hotel, the Bellevue House, at Wisconsin and Broadway. The following year Juneau helped launch a newspaper, the Sentinel. Juneau was badly affected by the Panic of 1837. Rising costs and plummeting land values sank him deep into debt. Despite these difficulties and an ongoing rivalry with West Side founder Byron Kilbourn, Juneau retained a good reputation among contemporaries. 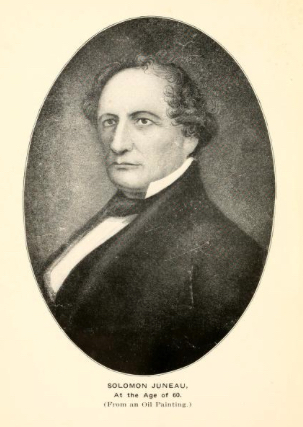 In 1837, he was chosen president of the town administration that oversaw the East Side, served as Milwaukee County Register of Deeds, and acted as a director of the Milwaukee and Rock River Canal Company. When Milwaukee officially became a city in 1846, Juneau was elected its first mayor. A frontiersman by nature, Juneau left Milwaukee just two years later. He founded a settlement named Theresa in Dodge County, opened a grist mill and general store, and reentered the fur trade. Juneau died on November 14, 1856 during a trip to the annual Indian payment at the Menominee reservation. His body was returned to Milwaukee for a funeral held at St. John’s Cathedral. Originally buried in a Catholic cemetery near 22nd Street and Wisconsin Avenue, Juneau’s grave is now located in Calvary Cemetery. ^ John Gurda, The Making of Milwaukee (Milwaukee: Milwaukee County Historical Society, 1999), 14-15. ^ Alice E. Smith, The History of Wisconsin. Vol. 1, From Exploration to Statehood (Madison, WI: The State Historical Society of Wisconsin, 1985), 113; Gurda, Making of Milwaukee, 16. ^ Gurda, The Making of Milwaukee, 16-17. ^ Gurda, The Making of Milwaukee, 19-20, 23-28. ^ Gurda, The Making of Milwaukee, 31, 29-30. ^ Gurda, The Making of Milwaukee, 40, 56; Bayrd Still, Milwaukee: The History of a City (Madison, WI: The State Historical Society of Wisconsin, 1948), 35, 39, 42. ^ Gurda, The Making of Milwaukee, 89. Smith, Alice E. The History of Wisconsin, Vol. I: From Exploration to Statehood. Madison, WI: The State Historical Society of Wisconsin, 1985. Still, Bayrd. Milwaukee: History of a City. Madison, WI: The State Historical Society of Wisconsin, 1948.